Maintenance perimeter sprays are a good preventative treatment at preventing many unwanted crawling insects in our homes. We recommend sprays done four times yearly every 2 to 2 1/2 months during the active season, spring to fall. We will spray up the foundation wall 2' and out from the foundation approximately 6-8' and the bushes or plants in that area. 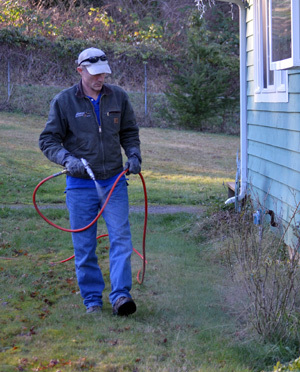 We will also spray decks, posts, fences and electrical lines that touch the house, as insects will use these as pathways. Extended perimeter sprays include this perimeter area as well as around doors and windows and eave/gutter areas where spiders and wasps are likely to be. In cooperation we ask that you keep bushes and plants trimmed back away from the home. Thick foliage makes it difficult or impossible for the treatment to reach the ground where insects are likely to travel. Foliage touching the house makes easy pathways to enter into the structure. It is our goal to keep your home as pest free as possible.